The Forty Days of Musa Dagh is Franz Werfel’s masterpiece—the novel that brought him international acclaim in 1933 and drew the world’s attention to the Armenian genocide. It is the story of how the residents of several Armenian villages chose to disobey the Ottoman government’s deportation order and instead fortified a plateau on the slopes of Musa Dagh—Mount Moses—and resisted Ottoman soldiers and military police during the summer of 1915, while holding out hope for the arrival of the Allies. 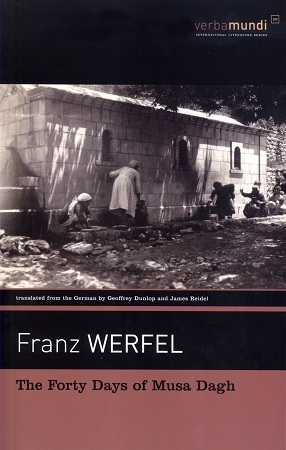 The English translation by Geoffrey Dunlop has been revised and expanded by translator James Reidel. The Dunlop translation excised approximately a quarter of the original two volume text; Reidel has restored the pages that Dunlop had cut, selecting and translating passages that contribute significantly to the story. The result is a fuller picture of the extensive inner lives of the characters, especially of the hero Gabriel Bagradian, his wife Juliette, and their son Stephan and Iskuhi Tomasian, the damaged 19 year-old Armenian woman, beloved by the older Bagradian. Reidel, a poet, has thoroughly revised the 1934 translation, incorporating the stronger meanings and context—intended for readers living in Nazi Germany—as well as undoing the censorship of Werfel’s original text. In bringing The Forty Days of Musa Dagh back into print and revising the English translation, the aim to make this new edition more faithful to the book Thomas Mann read “with pleasure and profit” in German.